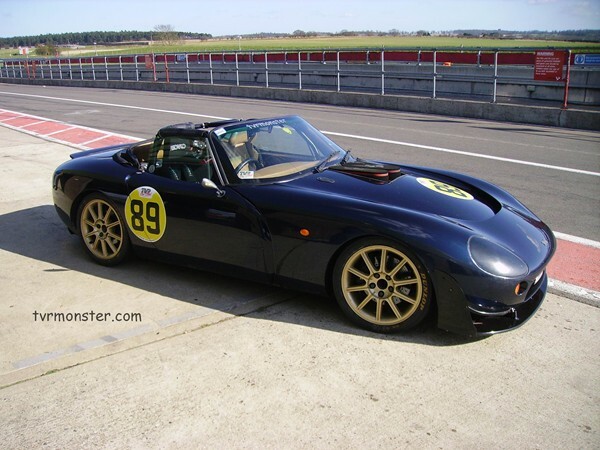 TVR Monster - The Spirit of the Monster. tvrMonster "Sagariff" - The 2008 Season begins! Our intensions when racing were purely to have a go. Missing three races and having a heavy car, we only hoped to finish the season around 7th in “B” but technical failures and accidents put a couple of front runners cars out and the car was much stronger than we’d hoped. We were 2nd in our first race and 1st in our second in appalling conditions at Pembrey. Torrential rain meant that my heavy, high torque car was in the overall lead at one point…I nearly retired after that weekend. Surely it couldn’t get better than that! It did fortunately. Three Class wins including a Double Win at Brands Hatch at the last meeting of the year over Jonnny Wilson’s +400bhp Cerbera secured the runner up position. Superb! I’m sure you’ve seen the race videos in our Galleries. So what new for 2008? Well, the Reg’s have changed for a start, so now its 300bhp at the wheels (ATW) policed by data loggers. That’s about it for Group B. 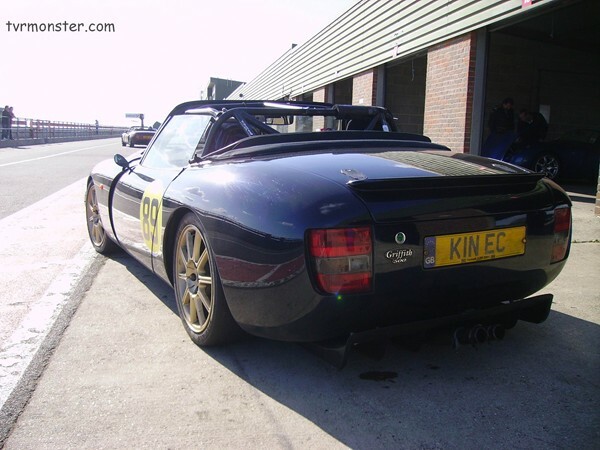 Any tvr…so long as its 300bhp atw or less. We run around 385bhp at the flywheel, so with losses in transmission around 335bhp atw. With the 1.1 tonne weight that puts us about right so fortunately no work there. Improvements must come from Aero, Handling…Oh yes…and Talent! Since I could improve on all of these areas I called SC power for their help with the Aero. I have known Colin & Dave (Harvey) for a number of years and know their work to be top notch. Their aero kits had just surfaced at the last “Griff Growl” so I was keen to get a set up on my car. Now I had had my kit on order for the best part of a year, but the Super-charger part of their business was keeping them so busy I had to wait, but after bending their ears consistently at the end of last season, I managed to get them on it. They had previously done some work on a diffuser for Marc Hockin’s Race Griff in 2006 so I knew that worked. The only change I made was to have the length shortened to stay within the Griff’s footprint. This reduced the effect slightly but as I already had my own proven boot lid “kick tail” spoiler, I was confident that the effect would still be worth it. The exhaust tailpipes are also changed to exit straight out the back. This helps airflow and the position through the diffuser, but the original can be refitted if the diffuser is removed for road use. Next the splitter. This is slightly more complex. Again I wanted the car to be as fast as possible and the kit as dramatic as possible, but I also wanted it within the original footprint and allow the car to be returned to original within 30mins or so. Again Colin & Dave came up trumps. The Splitter is basically the same as their road going version and fits over sleeping policeman etc (remember this is also a road going car!) but has additional winglets and side plates. The overall effect is to remove the famous “Griff-Lift” caused by the forward facing radiator, generate some real down force and finally control the air down the flanks of the car reducing its frontal air displacement. We knew this was possible as I’d already head a couple of my own splitters on the car. Well, we had it all strapped on and it looked awesome (that another major box ticked!) but would it actually work at the track? 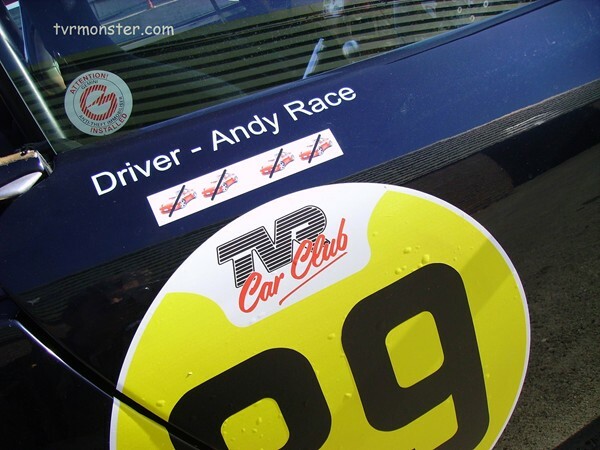 Our first test date was at Brands hatch on a tvrMonster Academy day with Mike Caine. The car was fine, but in +2 degree temperatures we weren’t going to prove anything. Suffice to say that the car was very controllable and certainly no worse! This may sound like a funny comment to make, but whenever you change anything on a racecar, there’s a good chance of it going slower before you dial it in and get faster, so I was pleased. It also had its first 120mph speed test…it all stayed on. A month later and we were at Snetterton. Not a great circuit for Aero (many racers remove their kit as the drag from the two big straights often slows the cars more than it speeds them up in the corners) but it’s a track I know well and we had data from the previous years races. At the end of the day we were only 0.5 sec off full race pace whilst in road trim. Since this means no slicks, traffic and carrying +300kg of seats, trim and passenger…we were very pleased. Another test at Oulton Park again showed the cars potential, but conditions were poor so again road trim. Finally, last month we were at Snett again for our last pre-season test. Again we had the passenger seat in and the roof on etc but without a passenger so we were still carrying +60kgs or so. We had changed the front springs since the last visit as the front aero was developing so much down-force under braking that the car was dipping too much on entry to the corner. This proves the effect at the front, which I’d estimate to be around +120kg. With this cured the pace was fantastic. The car is now awesome on track to go with its looks. Carrying approximately +60kg and on old slicks we still clocked 1m 20s 03h from the video - a full 3.5secs quicker than our best Qualifying time there last year. In racing terms that’s huge. 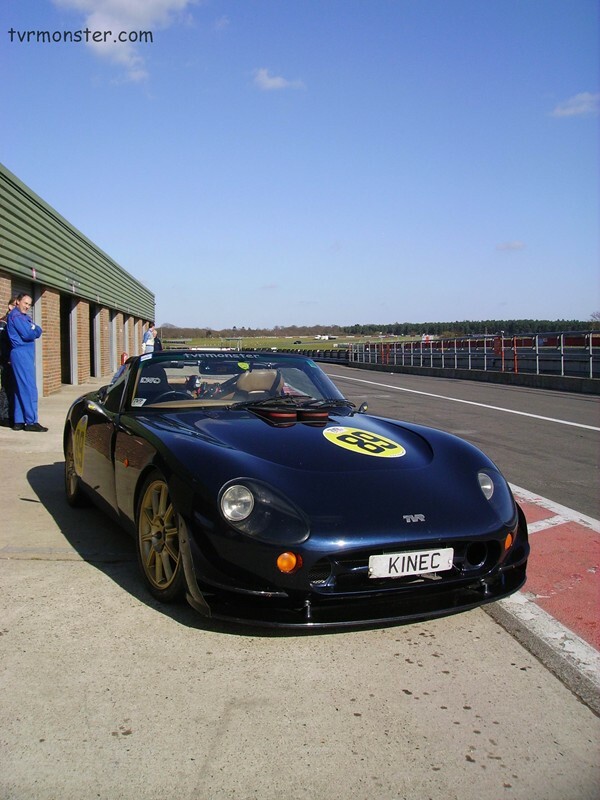 Granted I have had some training (with tvr “Driving God” Mike Caine) but the car is noticeably faster through the corners and exit speeds have increased dramatically so I hope to be pressing those RV8 Tuscans even harder this year. In all racing, no one stands still. The competition has also been hard at work. Graham Walden’s Tuscan is very (very) quick and back with a vengeance and I hear that Tony (Abram) now has a sequential gearbox in his Tuscan!!! Jonny Wilson is racing in the GT90s and so has to run max power (so moving back to Group A with 420bhp) and Marc Hockin now has a Group A AJP Tuscan so they are no longer a factor; but with new blood coming in with another Cerbera, Marc’s black race Griffith back out with a new driver AND another Griff from experienced racer Tom Stewart there’s plenty to contend with. So please come along and watch/support us any of the Challenge dates below. You’ll be very welcome and you never know…you may even get a mug of tea and there is always other races on the day, usually 8 or so plus Qualifying! As always, Sponsorship is an issue with racing. www.tvrcarparts.co.uk have continued their fantastic work with us and www.topcoatprint.co.uk have also been superb but we can always do with more help, so if you are a Griffith nut and would like to get onboard; it’s all deductible and a great fun. For major sponsors, we put the passenger seat back in and scare the living daylights out of you and your customers on our track days. They love it AND you get the chance to sell to them all day and all the way there and back. Last year our sponsors came with us to the Nurburgring and Spa. Over the weekend they tasted a Lambo VT 6, a Corvette LS7 as well as several track and race tvrs…so why not be there this year? Thanks to Simon at TGP you can follow the car via our race reports and videos. Simon has supported the tvrmonster project since our very first event way back in 2005 so I’m really pleased that he will be following us. I have seen his site grow over the last couple of years and its great that our love of the marques is in some small way helping to keep drivers entertained and in the fore font of the tvr scene.